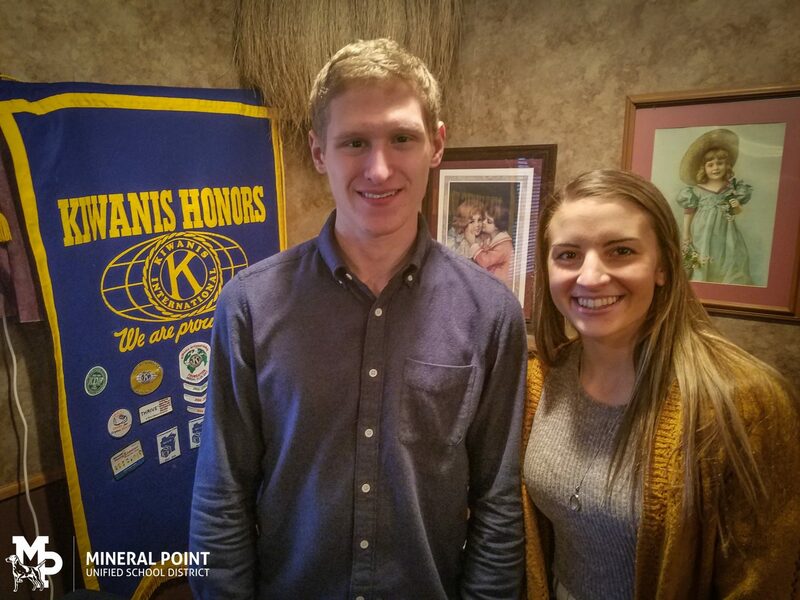 The Mineral Point Kiwanis Club honored its January Students of the Month at its meeting Tuesday, January 15 at the Pointer Cafe. The students, who are members of the senior class, are selected for this honor through a voting process by staff at the high school, and their biographies are written by themselves. Matthew Berg has lived with his parents, Sarah and Paul, his sister Megan and his brother Josh in Mineral Point his whole life. He would like to thank the Kiwanis and the teachers at Mineral Point High School for giving him the honor of being Student of the Month. He would also like to congratulate his Co-Student of the Month, McKenna Reichling. During the school year, Matthew is involved in a number of extracurricular activities. These include Mock Trial, Math Team, Future Business Leaders of America, Key Club, and Youth Group. All of these clubs have given Matthew opportunities to learn new things and meet new people. Future Business Leaders of America has been an especially large influence on Matthew. He has been in the club for four years and has been the treasurer for the past three years. With the guidance of Mrs. Kip Bakken, FBLA has taught Matthew the value of hard work. Outside of school, Matthew enjoys playing hockey and golf. Matthew has participated in hockey with the Dodgeville Ice Wolves ever since he was six years old. He cannot believe that it is already his final season, but he is looking for opportunities to play intramural hockey in the future. When first starting golf, Matthew did not like it that well, but after some practice, he has found great pleasure in it. He particularly likes to golf with his dad, grandpa, and brother. In high school, Matthew has enjoyed taking business, math, and science courses. These courses tend to be challenging and have very interesting subject matter. This year, Matthew took Music & Culture with Mr. Matt Nevers believing that he might not like it, but unexpectedly it could be his favorite class that he has ever enrolled in. Matthew is planning on attending UW-Madison next year. He has not decided on a major yet, and is not near choosing one. He would like to thank all of his teachers for helping him throughout high school and he would also like to thank his parents for all the support they have given him. McKenna would like to begin by congratulating her classmate, Matthew Berg, for also being selected as January’s Student of the Month. She would also like to thank Mineral Point’s Kiwanis for allowing her to be apart of such an honor. McKenna grew up on a big farm outside of Mineral Point with her three siblings, Whitney, Myles, and Ryan, along with her parents, Pat and Diane. Her childhood consisted of raising and showing livestock at the Iowa County Fair, playing basketball nonstop, and messing around on the farm with her siblings. In addition, McKenna would voluntarily undergo her older sister’s pretend procedures and checkups when she was younger. Whitney, who was practicing to become a registered nurse, would take McKenna’s vitals along with some of her blood. Somehow, this inspired McKenna to follow in her sister’s footsteps. Once her high school years came forward, McKenna began to think more seriously about nursing. Her first big step was receiving her Certified Nursing Assistant license from Southwest Tech. She is now working at Upland Hills Health nursing home and has stated that “it has been such an amazing opportunity that has opened my eyes to a new world.” She plans on becoming a registered nurse while inspiring and speaking to others about mental health. After her older brother’s recent death, McKenna has made it her goal to help others who are fighting a battle against mental illness. McKenna plans on attending Edgewood College in Madison to pursue a major in nursing and a minor in psychology. Currently, McKenna is involved in many school activities. She has participated in Forensics, Key Club, volleyball, and FFA all four years of high school. She has also been a member of Student Council all four years and is currently the Senior Class President and a member of National Honor Society. In addition, McKenna joined the Mock Trial team that went to state for the first time last year. However, her biggest passion is basketball. McKenna has received a varsity letter in basketball all four years, contributed in winning a state championship, awarded All-Conference titles, and won two conference championships. Furthermore, when she’s not on the court, McKenna works hard in class. She has received high academic honors all four years of high school. McKenna says she is grateful for all of her experiences and the friendships made through her high school years. Finally, McKenna would like to give a big thanks to all of her teachers. She says, “they were a big part of my success at Mineral Point and gave me the confidence I have now.” She would like to thank Mrs. Cindi Nothem especially for challenging, guiding, and supporting McKenna through the most difficult part of her life. “Her door was always open if I needed to talk. She was always so supportive and was willing to listen to all of my problems,” McKenna says. McKenna would also like to thank her parents, community, and peers who have given her support and motivation over the past 18 years.